This is not so much of a review by me but a chance to gaup in awe at some superb carp caught recently using Carple Steamers Baits from the Baitmaster. Words seem unncessary - just feast your eyes on these beauties and then head over to THE BAITMASTER to order your baits direct from them. Red Crab Steamers have been catching fast and furiously where ever they go, whether it's European or British Waters. For example Ben May from Carpers.net Forum has recently won the Seniors/Juniors competition, which was held at Etang De La Boissonie (Carp Anglers Dream) in France having hauled in a mighty large bag of Carp weighing 374lb over 48 hours. Why not get some Red Crab Steamers for yourself. Kevin Stait is just one of our many successful anglers baiting up with Carple Bloody Squid Steamers. 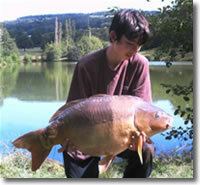 Here's how Kev's been getting on since changing his bait over to Bloody Squid Steamers. Carple Red Lobster Seaweed has also seen some great catch reports. Let's see what Clint has to say about his recent session. 18mm Carple Red Lobster & Seaweed Steamers, Carple Green Crab 'n Lobster Stik Mix accounted for these carp. The venue was a local lake. The day started well Carl with a few fish to just over 10lb but as the morning turned into afternoon the fish came thick and fast. Rig set was a 5oz running lead, hook link 15lb E.S.P sink link, hook Korda Hybrid size 6. 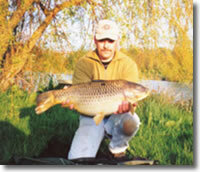 Best fish was a 23lb common followed by 20lb, 20lb 8oz, 19lb,14lb. Total fish caught 12, size and quantity wasn't at all bad for just a days session. Why not get some Carple Red Lobster Seaweed Steamers for yourself. Qaulity fish caught using quality baits. Get yours NOW ! !